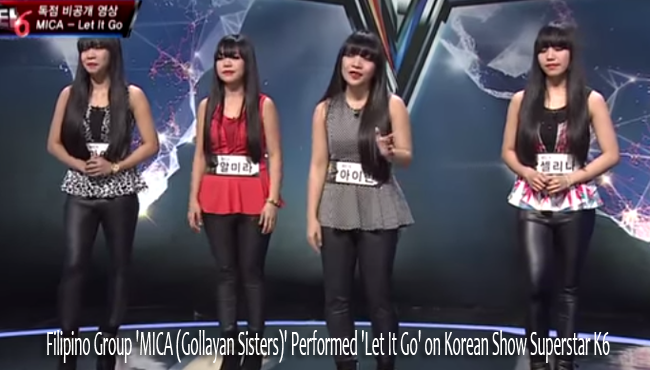 Let It Go fever is not yet done, especially when there is a viral video of MICA (Gollayan Sisters) recently setting the KPOP stage on fire with their own rendition of the Disney hit. Indeed, Superstar K6 judges were in awe at how the sisters arranged and delivered the song. Superstar K6 is one of the most prestigious televised singing competition in Asia. They had an audition in Manila last June 21,2014 at SM North Edsa. The prizes are $500.000 and tickets to South Korea. MICA, formed from the initials of the sisters Mylene, Irene, Celina, and Almira, were chosen to represent our country and compete in the Land of the Morning Calm.It is not clear as to when the viral video was taken but it is clear that the sisters are total packaged performers. According to them, they had been long time KPOP fans and they could not hide their mixed surprise and excitement when they saw Ailee, their Korean idol, as one of the judges. They confidently and fluently performed the artist’s hit single ‘U and I’, and the judges couldn’t help but be amazed. Ailee said that their version was the best that she had heard of, and she was really touched.Almira was then asked to sing any song and she had chosen ‘Listen’ that made Judge Park Ji Yoon cry. They did their songs really well, however it is their version of Let it Go that circulates in the social media networks lately. The song 'Let It Go' had been popular since the showing of the movie ‘Frozen’ and people went crazy about doing various versions such as in different languages and even by a Korean Parody. Even local celebrities like Sarah Geronimo, Regine Velazquez and Anne Curtis performed the song it their own unique style. And speaking of letting go, MICA surely won’t let go of one thing, and that is their dream.